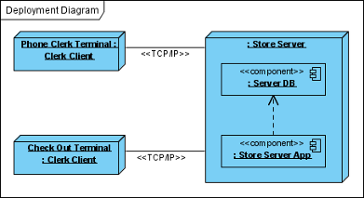 Deployment diagram is a kind of UML diagram that shows the physical aspects of an object-oriented system. It also shows the configuration of run time processing nodes and artifacts. Perform the steps below to create a UML deployment diagram in Visual Paradigm. In the New Diagram window, select Deployment Diagram. To create node in deployment diagram, click Node on the diagram toolbar and then click on the diagram. To create instance of node, click Instance Specification on the diagram toolbar and then click on the diagram. An instance specification will be created. To specify classifiers for an instance specification, right-click it and select Select Classifier > Select Classifier… from the pop-up menu. When the Instance Specification Specification window pops out, the Classifiers tab is opened by default. Click Add…. Then, select the classifier(s) in the popup window and click OK.
Click OK button to close the specification window. The selected classifiers are assigned to the instance specification. Move your mouse pointer over the source shape. Release the mouse button at the place where you want the instance specification to be created. Select Link -> Instance Specification from Resource Catalog. A new instance specification will be created and is connected to the source shape. Enter its name and press Enter to confirm editing. Similar to creating instance of node, you first create a component model element and then create an instance specification. However, this time assigns a component to the instance specification as classifier. After that the instance specification will be displayed as a component. Continue to complete the diagram.